Oklahoma Watch interviews state. Rep. Jason Nelson about his bills that would allow low- and middle-income families to use state funds for private educational services and parents to force dramatic changes at public schools. 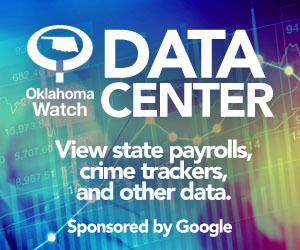 Albert Ashwood, Oklahoma’s emergency management chief, tells Oklahoma Watch’s Warren Vieth that even at a cost of $500 million to $1 billion, adding a safe room to every school in the state can be done. J.D. Strong, who directs the Oklahoma Water Resources Board, talks about the severity of the drought, climate change, water disputes and whether Oklahoma could suffer another Dust Bowl.